In the 13th century, the Cathars, who preach about good Christian beliefs, were being expelled by the Catholic Church out of the Languedoc region in France. One of them, called Jean Raymond, found an old church in which to hide, not knowing that beneath its ruins lay buried an ancient evil. 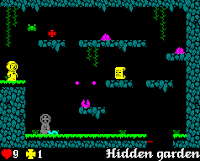 A style close to Spectrum ZX, with its dark background and bright colors, proper fit with the story, because it does look old and somewhat horrifying. 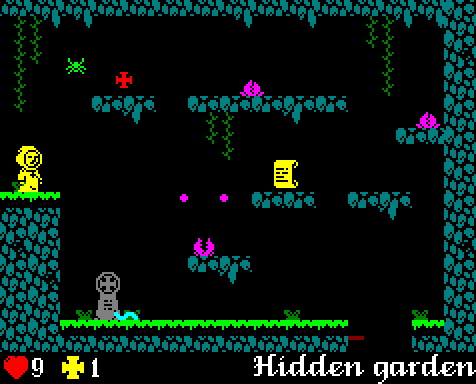 Also, the gameplay is direclty inspired by Manic Miner and Jet Set Willy. i am first far friend. I am now play it,it awesome game. Hasan, how much do you actually mean by "very long to wait"? Could you tell an estimate time in seconds? can u port some emulator for playing PSX or N64?